Wholesale voice is a growth market, with service providers building new capacities and launching new services. The primary wholesale service is long-distance transport and aggregation, with the key advantage being that country-specific features and domestic calling regulations are not required. The principal beneficiaries are developing countries, where, in many cases, the quality of VoIP is superior to that of traditional PSTN services. Central to the delivery of wholesale voice services are voice points-of-presence (POPs), which are interconnected to other service providers. 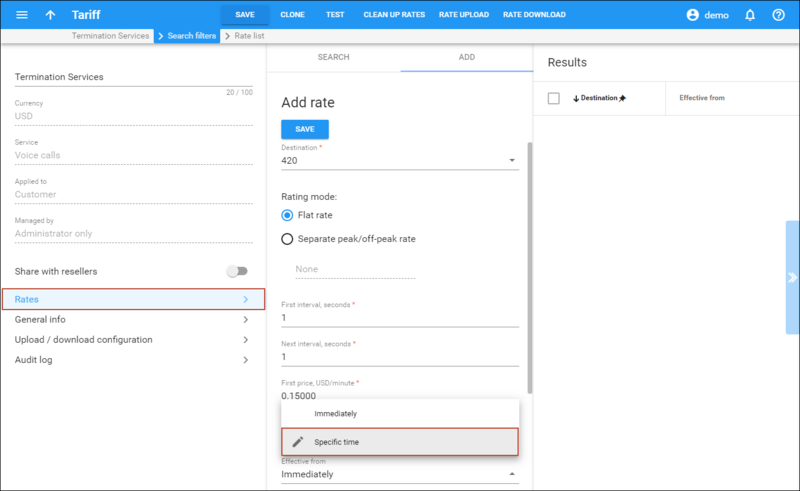 The Minutes Aggregation and Resale service (including ASP Termination) allows wholesale network providers to collect traffic from multiple originating providers, then aggregate and deliver it to the termination providers they select. · the tariff he is being charged by the vendor (B). The following configuration assumes that the service is provided using only PortaBilling® and a termination gateway. 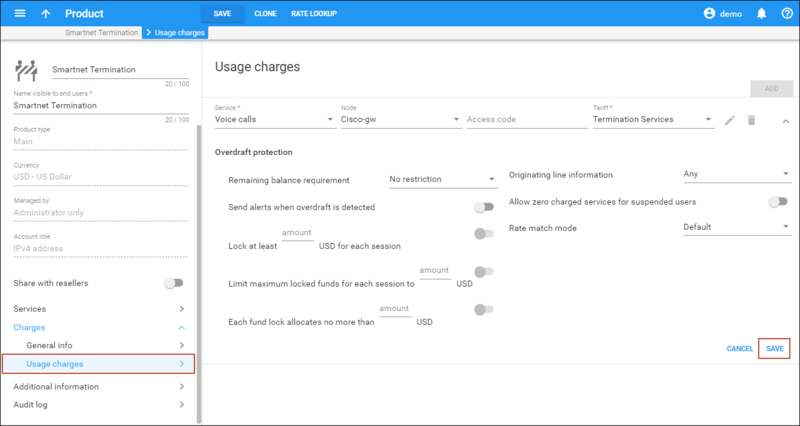 Please consult the Setting up a Wholesale Traffic Exchange section for an example of advanced wholesale VoIP services using PortaSIP®. It is highly recommended to use the latest telephony IOS and DSP firmware, and that the hostname be the same as the h323-id. NOTE: It is very important to have reliable time services. NOTE: It is important that you only use well-known time zone abbreviations which are supported by the billing engine. If unsure, use the UTC time zone. § “radius-server” commands will be available only after issuing “aaa new-model” command. Create a customer class which will apply to your customers. Create an account for each of this customer’s remote gateways. If you have just installed the PortaSwitch® software or dedicated a new billing environment to configure the services described in this handbook, make sure to first perform the initial configuration of PortaSwitch®. To do this, use the Initial Configuration of PortaSwitch handbook. Please refer to the Create Destinations chapter of the Initial Configuration of PortaSwitch section for detailed instruction on how to insert new destinations into the system. NOTE: Only your own gateways have to be entered as nodes. Remote gateways which belong to the customer, or ones which legally belong to you but are used solely by your customer(s), are not considered nodes. 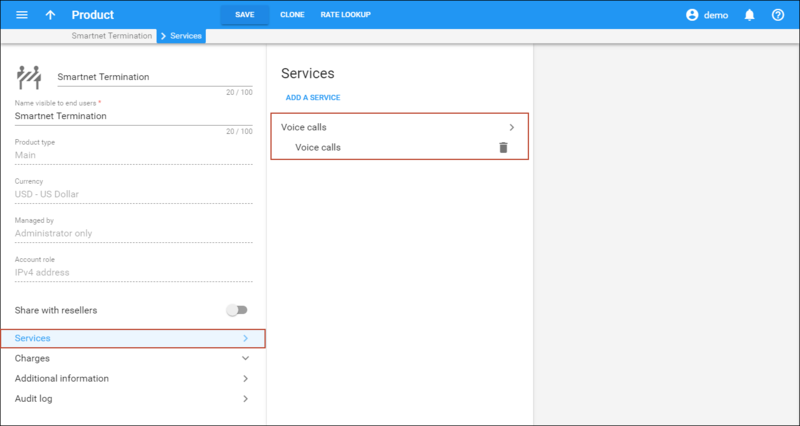 · Type – VoIP node type; select VOIP-GW. 4. Repeat steps 2-3 until all of your nodes have been entered. · Client protocol – Select RADIUS to enable the gateway (node) to communicate with PortaBilling® via RADIUS. · RADIUS source IP – Unless your gateway has multiple network interfaces, the value here should be the same as the NAS‑IP‑Address. Please refer to the Create Route Categories chapter of the Setting up a Wholesale Traffic Exchange section for a detailed description of the route categories creation. Rates define how a call to a specific destination will be charged (e.g. what the price per minute is, how to round off the total call duration, etc.). 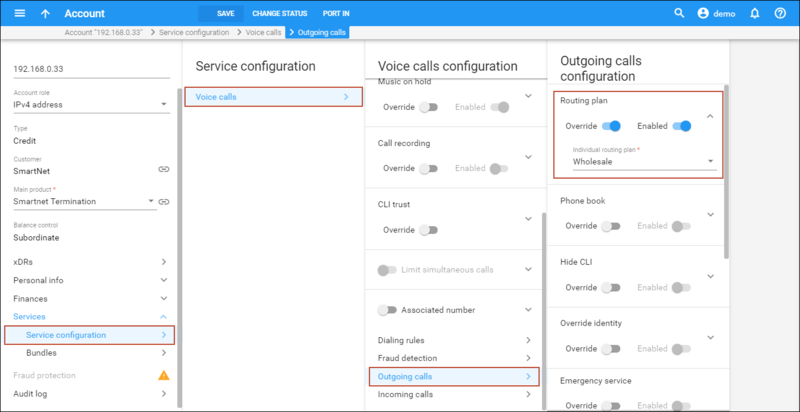 Please refer to the Call Billing Parameters section in the PortaBilling Administrator Guide for more details on available parameters for rating voice calls. 1. On the Tariff Management page you will see a list of available tariffs. On the vendor tariff’s panel (Termination to SPT Telecom), click Rates. 2. 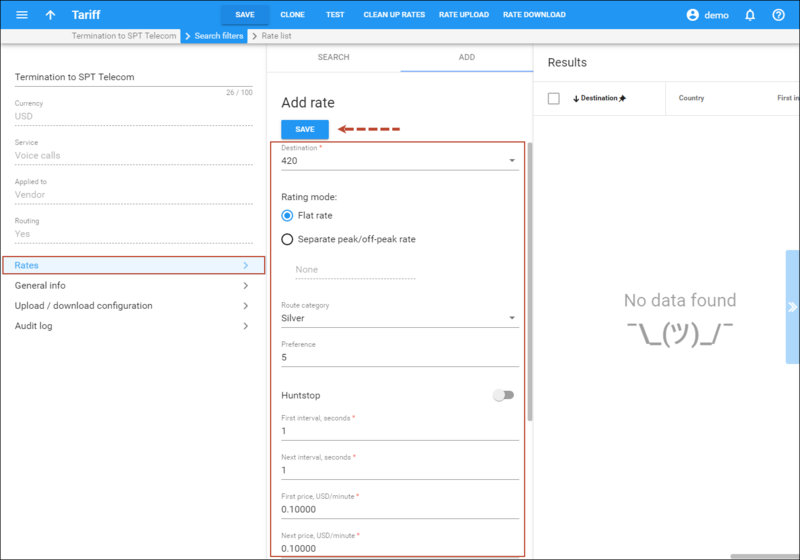 On the Add rate panel, fill in the required information (please refer to the Enter Rates in Tariffs with Routing Extensions chapter of the Setting up a Wholesale Traffic Exchange section for a detailed description of the available rate attributes). 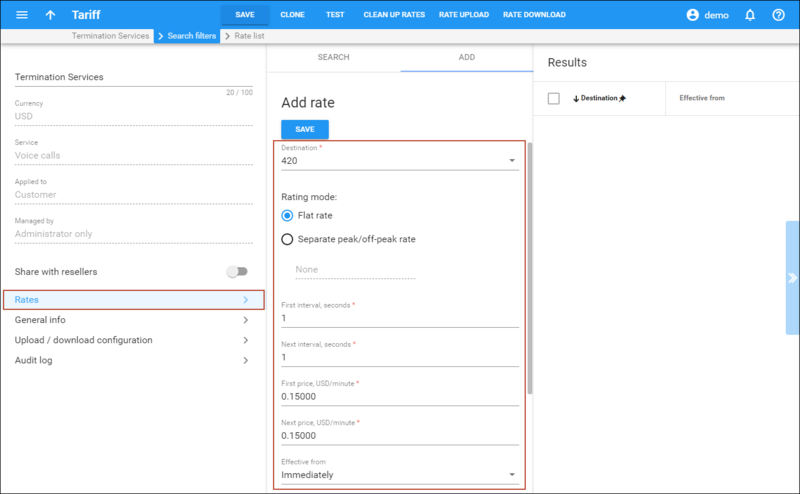 You also can upload rates from a .csv or .xls file – please refer to the description of this process in the Rate Import section. Perform the Create Tariff and Enter Rates steps until you have created a tariff with termination costs for each termination partner you have. 2. On the Create vendor panel, fill in the vendor details. Refer to the Create Vendors chapter in the Setting up a Wholesale Traffic Exchange section for a detailed description of the available attributes). 4. Repeat steps 2–3 to add all of your vendors. Connections represent the point from which calls leave or enter a network and are directed to or from vendors where charges are incurred. 1. 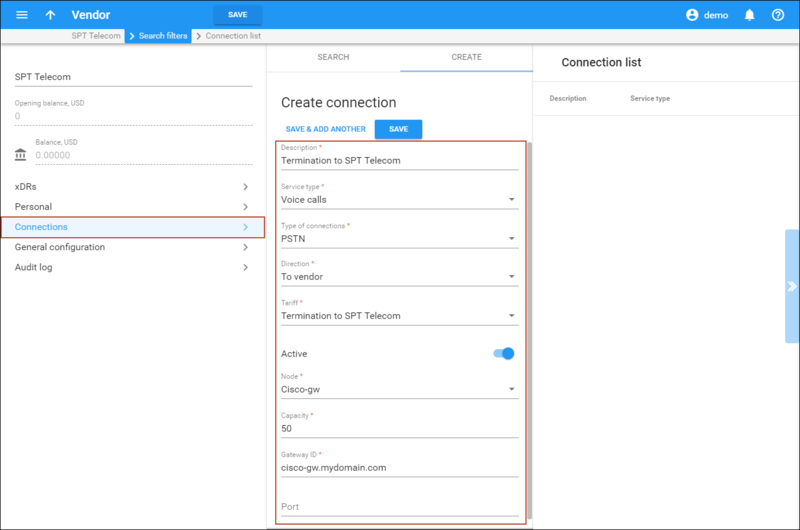 On your vendor’s panel (SPT Telecom), click Connections. NOTE: To set up the configuration, access the Connections group on the configuration server. By default, the ShowPSTNConnectionType feature is off; to activate it, select “Yes” in the corresponding field. · Node – Select the node you have created previously. · Gateway ID – The domain name of the vendor’s gateway. Normally you need a separate tariff for each of your customers. · Name – Type a short name for the tariff; this is the name you will see in the select menus. 1. Please refer to the Create Customer Tariffs chapter of the Setting up a Wholesale Traffic Exchange section for a detailed description of the available tariff attributes). 1. While on the Edit Tariff page, click the Rates icon in the toolbar. 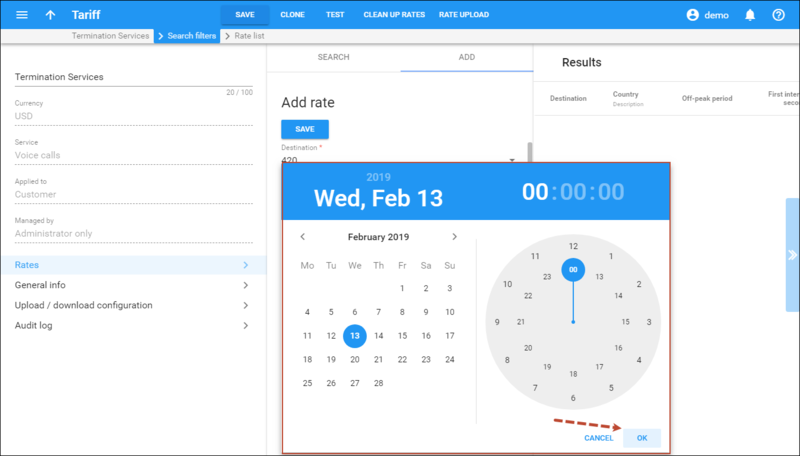 · Effective From – If you want this rate to take effect sometime in the future, you can either type in a date manually, or use the calendar (click the DD-MM-YYYY link). Otherwise, the rate is effective immediately. 5. Repeat these steps if you need to enter more rates. 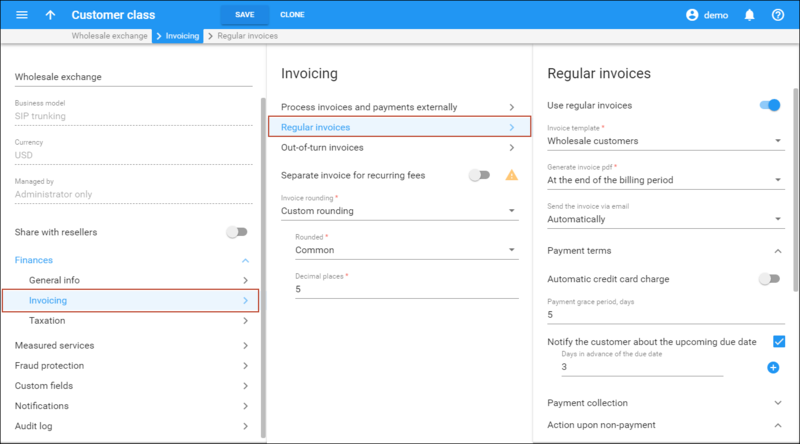 Perform the Create Tariff and Enter Rates steps described in the Setting up a Wholesale Traffic Exchange section until you have created a tariff for each account’s billing scheme. For example, if you plan to have two types of service packages (Termination-Easy and Termination-Gold) with different rates, you will need to create two separate tariffs. A routing plan allows you to apply individual routing methods to certain customers, i.e. blocking them from using certain carriers for termination, or, conversely, only allowing them to use certain carriers in a specific order. If you do not define any custom routing plans, the system default routing plan will be used, allowing access to all available carriers. 2. 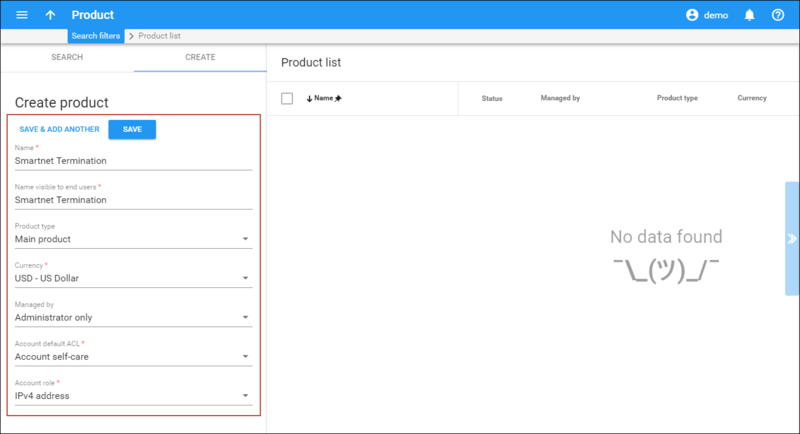 On the Create product panel, fill in the product details (please refer to the Create a Product chapter of the Setting up a Wholesale Traffic Exchange section for a detailed description of the available product attributes). For incoming VoIP traffic we normally do not really need different rating entries, as just one row with “ANY” node and tariff should be enough. However, if, for example, you want to let a customer send traffic to your gateway A but not gateway B, this can be achieved by using rating entries. · Node – Select the node that you previously created. Customer class provides the ability to define a group of parameters in a centralized way, then apply those parameters to many customers at once. 4. On the Taxation panel, select one of the available taxation methods and specify the taxation parameters for it. For the Fixed VAT Rate or Custom taxation methods, enable the Taxes included into rates / fees option and taxes that are calculated. 2. 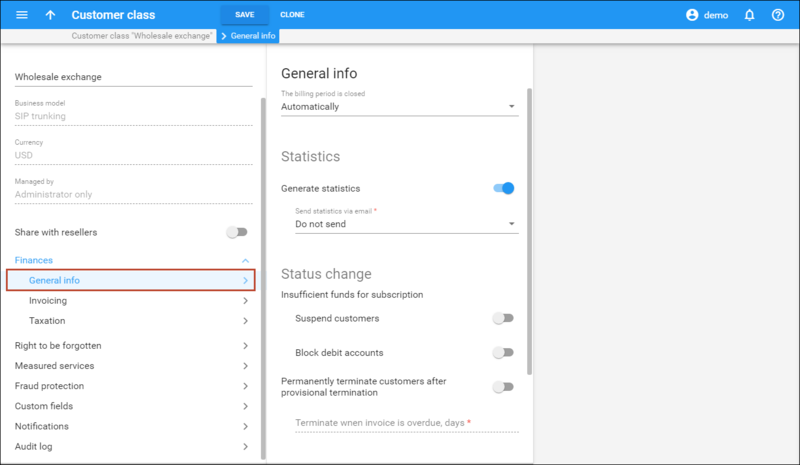 On the Create customer panel, fill in the customer details (please refer to the Create a Customer chapter of the Setting up a Wholesale Traffic Exchange section for a detailed description of the available fields). 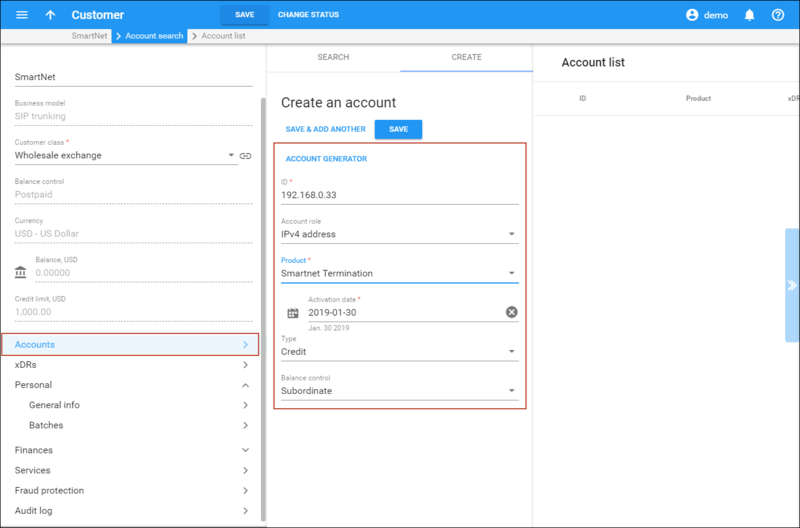 · ID – Identification of the account (value to be sent in the User-Name attribute). For an account which represents a remote gateway, this is normally an IP address. 4. 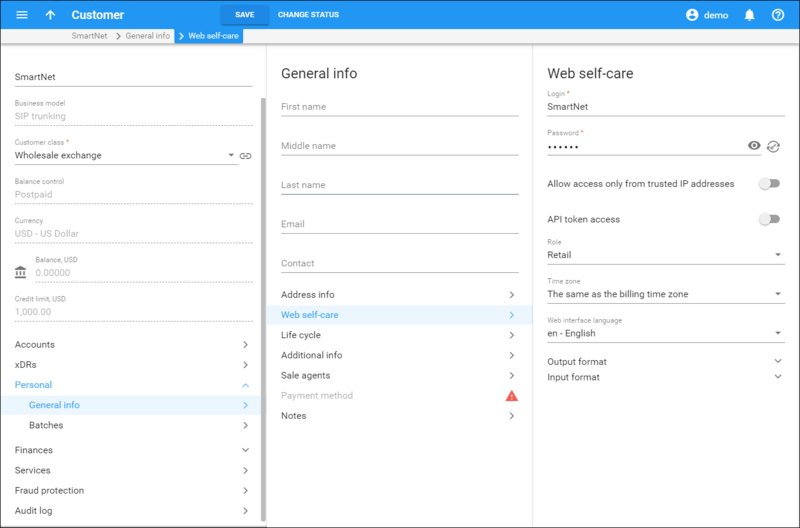 On your account’s panel, click Services. 6. Repeat steps 2-5 if the customer has more than one signaling IP address of the remote gateway / proxy.